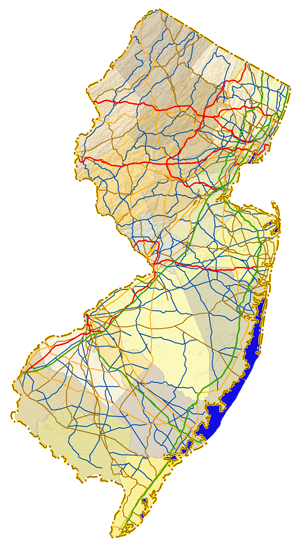 Sitemap to all pages covering the state of New Jersey. Page and photo contributions by Alex Nitzman, Andy Field, Carter Buchanan, Justin Cozart, Ian Ligget and Matt Guerrino. Sources: U.S. Census Bureau, State & County QuickFacts – 2012 estimates for cities, 2013 estimate for counties and the state. Statehood: 3rd state; admitted Dec 18th, 1787. New Jersey Nets (NBA) – moved to Brooklyn, New York for the 2012-13 season.